Have you ever wondered what the wizarding world might look like if it were graced with a character like Harry Otter? Or what American politics would be under the administration of Squirrelly Clinton? Maureen Lipman has. Inspired by her doodle of Oscar Wildebeest – a steer in a dinner jacket – the renowned author and actress began dabbling in the dark art of the unholy celebrity/animal mashup. When she woke at 3 a.m. and said out loud, ‘Tuna Stubbs!’, the die was cast. A book was born. 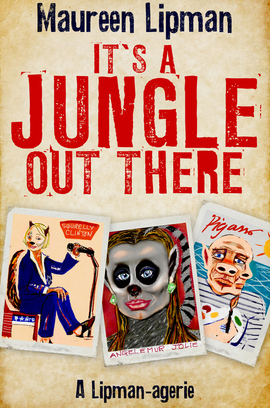 Sharp, funny and endlessly inventive, lt’s a Jungle Out There presents a dizzying array of stars as you’ve – really – never seen them before. Featuring such luminaries as Leonaardvark DiCaprio, Giraffa Nadal and Ellafantz Gerald, this otterly brilliant collection is guaranteed to quack you up.